On the surface, Niru’s life seems to be one of privilege and advantage. The son of wealthy Nigerian immigrants, at eighteen he is a track star who has already been pre-approved to go to Harvard. However, Niru is ashamed to be hiding a deep secret from his parents. Only his best friend, Meredith, knows what he is keeping from the rest of the world. Niru is gay. What follows is one of the worst “coming out” moments that could possibly happen to a young man. After his extremely conservative father sees a Grindr notification on his phone, all hell breaks loose. He beats Niru, and then forces him to travel to Nigeria in order to undergo a religious ceremony that will supposedly cleanse him of the demons that are causing these “unnatural” urges. This novel by author Uzodinma Iweala is a short and brutal look into the fears and anxieties that continue to plague homosexual teens. Mainstream acceptance of gay rights have grown by leaps and bounds in the past ten years, and yet there are still thousands of children who cower in fear at the thought of their family or church community discovering that they are different from the “norm” in any way. 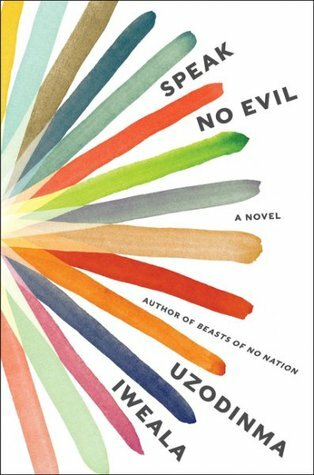 Niru, the protagonist in Speak No Evil, has his fears compounded by the fact that he is African-American and a child of Nigerian parents, a country where homosexuality is still punishable by up to fourteen years in prison in the southern states and death by stoning in the north. Iweala’s prose manages to be simultaneously poignant and gut-wrenching. I found myself rooting so strongly for poor Niru, and was disappointed and disturbed when it seemed that his chances for happiness were thwarted again and again by his family and his confusion towards his own sexual orientation. The chapters that are narrated by Meredith, are no less heartbreaking as she watches her dear friend spiral into depression and her own life ambitions begin to crumble. The only reason I cannot rate this novel higher is that I found Iweala’s writing style to be quite frustrating. He doesn’t use capital letters or quotation marks to indicate when a character is speaking. Because the novel is written almost as a stream-of-consciousness, this makes sense but I found myself confused and annoyed in turns when I could not figure out what words were being spoken aloud and which were taking place in Niru or Meredith’s mind. I must point out that the lack of quotation marks is a personal pet peeve of mine, one which will not necessarily detract from the anyone else’s enjoyment as they read this novel. I would absolutely recommend this novel. Speak No Evil presents an unblinking look into racial and gender politics which left me haunted for days after finishing it. You can find Speak No Evil here on Amazon or here on Book Depository.